As more field networks, typified by FOUNDATION™ Fieldbus, are made practicable, requirements for use of field networks have been gradually increasing for plant instrumentation based on a distributed control system (DCS). Whereas, DCS control with traditional 4-20 mA input/output signals is also indispensable to mission-critical plant instrumentation where high reliability and operation over a long term are needed. This means growing importance for DCSs to flexibly meet the requirements from each customer's standpoint, and connect to conventional input/output devices and various innovative field network devices. In Yokogawa's CENTUM CS 3000 R3, configuration of a DCS consisting of such diverse input/ output devices has been implemented on the basis of integrated engineering functions, which allows users to easily configure applications whatever the types of inputs/outputs of the controlled objects. The CENTUM CS 3000 R3 also provides a consistent operation environment in which users may not be conscious of whether each object is controlled by the CENTUM CS 3000 R3 or a fieldbus device. Figure 1 shows a window in which function blocks inside an FCS (hereinafter referred to as FCS function blocks) and function blocks inside a fieldbus device (hereinafter referred to as fieldbus FBs) are connected on a single control drawing for engineering. As seen from this, the CENTUM CS 3000 R3 makes it possible for fieldbus devices to be engineered in exactly the same way as for engineering of an FCS. After the devices are assigned, those assigned devices and function blocks in the control drawing sheets can be made related to each other by the simple drag-and-drop method between the device list view and a control drawing sheet. 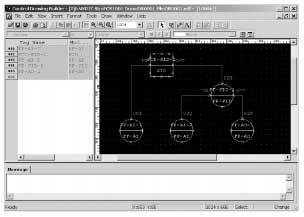 Instead of the drag-and-drop method, a method to automatically relate Control Drawing Builder and the function blocks that have the same tag name to each other is also provided. Adopting field networks does not mean to do away with all conventional devices at once, but rather, in most cases to gradually phase them out. In the integrated engineering environment provided in the CENTUM CS 3000 R3, the user simply has to draw connections between FCS function blocks and fieldbus FBs. Precisely speaking, those connections pass I/O terminals internally; however, the user need not be aware of this, allowing effortless engineering even when replacing conventional I/Os to fieldbus devices. The bottom line is that it is trouble-free to connect traditional I/Os and fieldbus devices to the same DCS as well as to replace traditional I/Os with fieldbus devices incrementally. A new task to find and download only the differences when modifying a control loop and downloading the loop configuration to fieldbus devices, is added. This speeded up the downloading and engineering while minimizing effects on control. 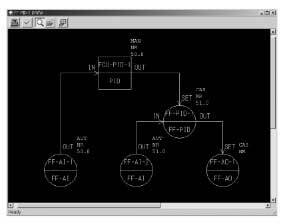 Be able to configure a huge number of control loops on control drawings. Have a quick device registration function and automatic assignment function. Be able to relate the control drawing sheets and devices to each other at a high speed. Be able to upload configuration data of a large number of segments all at once during maintenance. Control Drawing Builder is a proven program used in DCS engineering before fieldbus and has been well considered for application to large-scale systems. The multi-sheet generation function, allowing one-time generation of multiple control drawing sheets, supports fieldbus FBs, too. Besides, when drawing logical loops in Control Drawing Builder and later assigning devices, multiple drawing sheets can be instantly related to the assigned devices by using the tag names as keys. The quick device registration function, listed second, is realized by adopting a unique database. Operation and monitoring of fieldbus devices and fieldbus FBs, which are regarded as being outside the scope of a DCS system, are integrated in the CENTUM CS 3000 R3. More specifically, the standard operation and monitoring features originally provided with the CENTUM CS 3000, such as tuning windows, control drawing windows, and alarm/message management, are upgraded to support fieldbus devices and fieldbus FBs. This is detailed next. Displays all data items requisite to tuning a fieldbus FB, and lets the operator make changes to their values. Graphically presents the current statuses of a loop or loops as configured with Control Drawing Builder, in which FCS function blocks and fieldbus FBs are engineered in the same aforesaid way. Control drawing windows enable the operator to intuitively grasp the relationships between blocks and the current statuses of the loops. The control drawing window in Figure 3 shows a cascade loop consisting of a fieldbus FB for the secondary loop and an FCS function block for the primary loop. The operator can manipulate loops without being conscious of the location in which each block resides. Fieldbus FBs are handled in the same way as for FCS function blocks—in graphic windows, trend windows, and other windows, too. The CENTUM CS 3000 R3 handles alarms occurring in a fieldbus device as system alarms or process alarms to proactively make fieldbus devices that are set outside the scope of a DCS, part of the CENTUM CS 3000 R3 system. 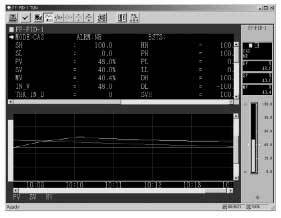 The Process Alarms window displays the messages of process alarms generated by fieldbus FBs. Process alarm statuses (blinking, acknowledged, or not yet acknowledged) are displayed in the same way as for those alarms in FCS function blocks. Process alarms can be acknowledged via the Process Alarms window and the like. The ALF111 fieldbus communication module developed for the CENTUM CS 3000 R3 supports four fieldbus segments per module. This exhibits high cost-performance, but since, conversely, a failure or maintenance of a single module results in loss of controllability of multiple segments, ALF111s are designed to allow dual-redundant configuration (see Figure 4). Transmits and receives control input/output data between the ALF111 and fieldbus devices. Reads and writes data in fieldbus FBs and on-demand transmissions from Plant Resource Manager or Fieldbus Builder. Receives the event and alarm messages transmitted from a fieldbus device when it detects an error or event, and transmits it to the FCS. The ALF111's capability of achieving dual-redundancy, which was not possible with the former fieldbus communication module, is a significant merit of the CENTUM CS 3000 R3. One of a pair of dual redundant ALF111s functions as a Link Active Scheduler (LAS)*2 in the corresponding segment. Switchover of the LAS takes place in accordance with the FOUNDATION™ specifications, namely, the FOUNDATION™ Fieldbus. According to the specifications, the LM that has detected the stoppage of transmissions first from among the link masters (LMs)*3 connected to a fieldbus segment, starts functioning as the LAS. 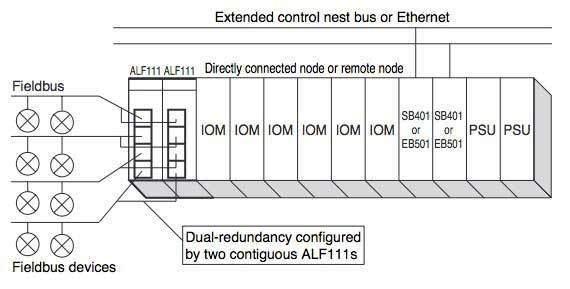 However, switchover of the control right between a pair of ALF111s and switchover of the LAS takes place independently so that control actions with I/O data transmissions across fieldbus devices can be continued, without interruption even if there is a time delay from an occurrence of a failure of the ALF111 functioning as the LAS, until the switchover of the control right is complete. Ever-increasing use of fieldbus must be one of the inevitabilities in the evolution of control systems. The problem here is the increase in engineering work. A solution for this is to provide sophisticated engineering tools. We believe that the integrated engineering, operation, and monitoring environments introduced in this paper provide the solution to this problem. As field communication is growing in importance more and more, we intend to develop and offer diverse, useful engineering tools. Kai Tadamichi, "Fieldbus Kiso Book (Japanese, "ABC of Fieldbus")," Ohmsha, 1995, in Japanese. Sato Masahito, "Engineering Functions of CENTUM CS," Yokogawa Technical Report, Vol. 43, No. 1, 1999, pp. 17-20, in Japanese. *2 A link active scheduler (LAS) is a deterministic centralized bus scheduler controlling the transmissions. Only one Link Master (LM) device on an H1 fieldbus link (segment) can be functioning as that link's LAS. *3 A link master (LM) is any device that contains LAS functionality and in which LAS functionality is enabled in the configurations. The product and company names appearing in this paper are trademarks or registered trademarks of their respective holders.